Are you looking to SAVE THOUSANDS on your next home purchase? Well look no further, this home qualifies for a NO CLOSING COST LOAN. Awaiting your arrival is this well-maintained energy efficient home with 5-bedroom, 2.5 bath with 3-car garage nestled in the beautiful Gated Community of Hawks Point. Adorned with a nicely painted exterior, mature landscaping and a conservation lot with the privacy of no rear neighbors. 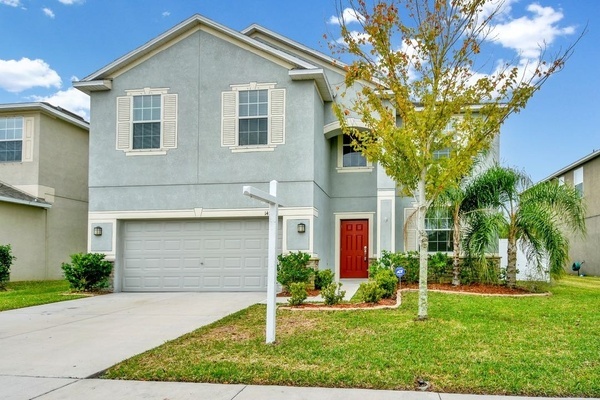 Upon entering the home, you welcome the bright and open floor plan with Crown molding, ceramic tile, formal dining room and spacious kitchen overlooking the family room. The kitchen boasts granite counter tops, staggered 42” cabinets, stainless steel appliances and casual eat in space. Venturing upstairs you will find NEW laminate wood flooring throughout the spacious loft and stairs. The upstairs Master suite features tray ceilings, walk-in closet w/shelving and master bath with Dual sinks, garden tub & separate walk in shower. Each room is generously sized with built in shelving in closets to optimize space. Additional updates include NEW hybrid water heater &ceiling mounted storage in garage. Out back you have a covered lanai with 700 Sqft paver patio and NEW white vinyl fencing. Hawks Pointe is a gated community offering amenities including a pool, clubhouse, fitness center, playground, dog park, and much more. Conveniently located near I75, US301, US41 and I4. Quick commute to MacDill AFB. Just minutes from everything the Tampa Bay area has to offer. Schedule your private showing today!